James Jordan, PhD, seeks solutions for pressing clinical needs and focuses his research on cardiovascular solutions for pediatric patient populations. He partners with industry to investigate therapeutics and medical devices and execute cardiovascular-related translational studies. James Jordan, PhD, earned his doctorate in pharmacology from Wake Forest School of Medicine while performing most of his thesis work at the Cardiothoracic Research Laboratory at Emory University, part of the Carlyle Fraser Heart Center. Following his degree, he spent time in the anesthesiology department at Brigham and Women’s Health Hospital in Boston, Massachusetts, where he worked within the Center for Experimental Therapeutics and Reperfusion Injury. In 2003, Jordan returned to Wake Forest School of Medicine to join its department of cardiothoracic surgery where he is the director of its cardiothoracic surgery center. 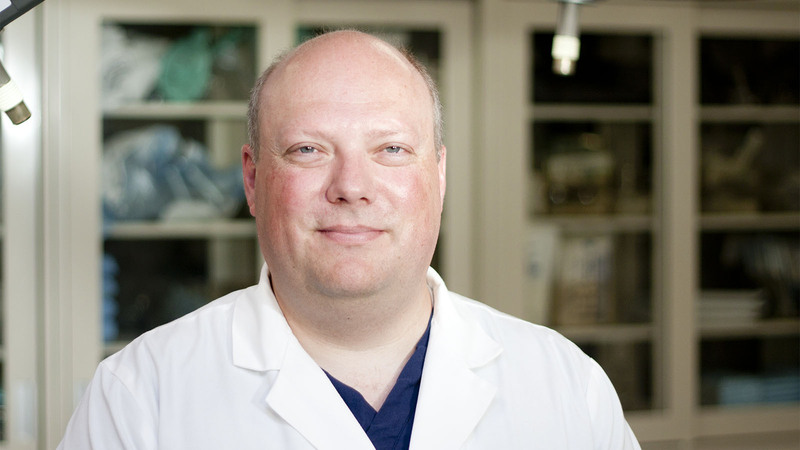 Jordan’s experience in cardiovascular medicine is broad, but he has dedicated extensive research to cardiothoracic surgery models, including heart valve replacement surgery. Valvular heart disease is widespread and repair techniques are not viable options for many patients. While valve replacement surgery has become routine, there are still significant problems with all types of valve prostheses. Thus, optimization of valve replacement surgery as well as the replacement prostheses are important research endeavors with great translational value. Jordan believes that tissue-engineered heart valves may be a solution to current imperfections and has dedicated significant effort toward improving such options. Currently, Jordan is one of two team leaders involved in the development of a novel technique of tissue-engineered heart valve research. Their theory involves creating a valve scaffold that directs circulating progenitor cells to repopulate and remodel in a fashion similar to that which occurs during fetal development. Jordan leads the preclinical research unit of this particular project, drawing from his many years of surgical experience using large animal models. In addition to Jordan’s tissue-engineered valve research, he has completed studies for the Children’s Heart Foundation investigating novel surgical perfusion strategies for neonatal patients undergoing cardiopulmonary bypass for repair of congenital defects. Jordan has also worked with a range of industry partners, investigating both therapeutics and medical devices. He is presently developing a novel arrhythmia device conceived by a clinical colleague and is skilled in performing clinically-relevant procedures such as myocardial ischemia-reperfusion, cardiopulmonary bypass (in both adult and neonatal models) and valve replacement surgery. Jordan is also the current chair for Wake Forest School of Medicine’s Institutional Animal Care and Use Committee. His clinical connectivity and training in large animal models place Jordan in an ideal position to execute cardiovascular-related translational studies.